Nikon | Imaging Products | Best of the Rest / Nikon Family Cousins, Part 13 : "Nikon FM2"
Home > Products & Support > Imaging Products > History > Camera Chronicle > Part 13 : "Nikon FM2"
Part 13 : "Nikon FM2"
The speed up of the shutter has taken surprisingly much time among the rapidly developing camera mechanism. Regarding the focal plane shutter, "Leica" with horizontal-travel cloth curtain shutter and "Contax" with vertical-travel metal curtain (blade) shutter were competing and attained the highest speed of 1/1000 sec., and 1/1250 sec. 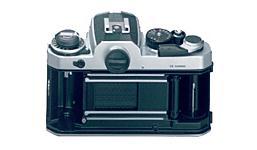 respectively in 1930s, and in 1960 "Konica F" first attained the speed of 1/2000 sec. Regarding the lens shutter, the highest speed was 1/3000 sec. with "Minolta V3" (1960), but it had a restriction on usable aperture stop value when selecting the higher speed (e.g., when selecting 1/3000 sec., only f/8 to f/22 can be used). Except that, the highest shutter speed of general use cameras was 1/2000 sec. until 1982 when the Nikon FM2 was put on the market. Make the shutter blade light ! It was in 1977 when Nippon Kogaku K.K. (present Nikon Corporation) started the study of the high-speed shutter faster than 1/2000 sec. The momentum was a word of a professional photographer given to one of the leading member of Nippon Kogaku, "At a news spot, due to the influence of intense light of TV clues, the subject doesn't stop still even with an electronic flash fired. In order to prevent such a situation, we wish you could make the flash synchronization speed faster. Even if the exposure of the full format of the 35mm [135(36 x 24mm)] format film is to be sacrificed for that purpose, we can stand for it." The study of the high speed shutter started not for the "realization of 1/4000 sec." but for the "faster X sync. speed". To meet this needs, a special team was organized, the member of which were selected from such departments as designing, technology and research. In order to increase the speed of shutter blade travel to cope with this request, it is necessary 1) to increase the driving force, or 2) to lighten the mass of the shutter. Considering the strength of the mechanism, it may not be permitted to increase the drive force too much. It was decided with little fuss to adopt, not the horizontal-travel drum type shutter, but the vertical-travel square type shutter. "How to lighten the mass of the blade" remained a difficult problem for the team and it took much time before the decision of its material. After much trial and error, titanium (Ti) was adopted for the blade material. Aluminum (Al) alloy (duralumin) was also one of the choice, but was not accepted due to insufficient strength. The part around the caulking pin to join with the arm, which control multiple blades, couldn't endure and broke. After much trial, e.g., affixing a thin titanium plate on a titanium frame, just as a Japanese "shoji" paper-screen sliding door, or stamping a plate by a press to make it thinner, leaving the peripheral as it is, finally the honeycomb pattern etching method was found. It is a chemical etching method to etch a certain part of a thin titanium plate thinner in a "honeycomb" pattern. The circumstances of that affair was covered in detail in the "35mm Single Lens Reflex Camera Series No.11" - "All about newest Nikons" - a separate volume of Modern Camera Series issued by Asahi Sonorama in November 1984 (in Japanese only). By the way, honeycomb pattern is a hexagonal shape which brings up the image of beehive (honeycomb). It is considered to have an advantage of extra strength. A sequel to the story: COPAL CO. LTD. (present NIDEK COPAL CORPORATION) which cooperated with us in that project has kept studying the caulking of the aluminum alloy which was given up at the early stage of the development, and succeeded to develop a special caulking technology. Therefore, in later days, 1/4000 sec. shutter speed was attained even with the aluminum alloy shutter blade. The first prototype was an electronically controlled shutter ! In this high-speed shutter project, the object "to which model the shutter is to be incorporated" was not fixed. It was agreed that the model would be discussed when the development would have been completed. In order to attain 1/250 sec. sync. speed, the vertical length of the frame might be cut to , for instance, 20mm instead of the regular 24mm, then the product might not be for general users. In that case it was obliged to be a special product for the limited users such as press photographers. Having acquired an outlook to some extent by this experience, about 30 pieces of the second-lot prototype were made. They were also electronically controlled shutter units and again incorporated into the FE bodies. However, the top speed was advanced to 1/2000 sec (photo: right). It was just "by chance" that the FM2 was destined to be the model into which the high-speed shutter which became realistic backed by the production technology was incorporated. Around that time, the renewal plan for the FM (released in 1977) to incorporate new functions adopted in the Nikon FE which was released in 1978 was on the way. They were : to make finder screens be interchanged through the lens mount opening, to put a ready-light inside the viewfinder to indicate that the dedicated speedlight unit is fully charged, to simplify the complicated power switch as a timer switch by pressing the shutter-release button half way . . . .
Owing to the timing of the development of a high-speed shutter just coincided to this project by chance, the FM2 was loaded with the honor of "the first model incorporating the world fastest 1/4000 sec. shutter". However, the original object, X synch speed of 1/250 sec. was changed with some allowance to 1/200 sec. considering that some electronic flash units have longer duration. The fact is that there was another new mechanism beside the high-speed shutter which we wished to incorporate into the Nikon FM2. It was an automatic film loading which simplifies film loading procedure. It had been incorporated in the production model prototype but was withdrawn in the last minute because of somewhat unstable reliability. In a camera with automatic winding, the winding speed or the torque loaded with the winding mechanism is kept virtually constant, but the situation is quite different in a manual winding camera. Some people wind the lever slowly and gently with a willowy finger and some people wind so quickly and powerfully as they might have torn off the lever. It was very difficult to realize such a perfect mechanism as would load the film surely whoever might operate. After all, an automatic film loading was postponed until the Nikon F-301 that was exclusively for automatic winding was put on the market in 1985. In case of automatic film loading, the winding method is "regular winding" to wind the film around the spool with the film base outside, but FM-series cameras so far adopted so called "reverse winding" to wind the film with the emulsion side outside. Withdrawal of automatic film loading resulted in a big change to reverse the rotating direction of the spool. The development afterwards was just as you, readers, know well. Following the Nikon FM2 with a mechanically FA (1984) were both equipped with an electronically controlled 1/4000 sec. shutter, and, with them, the X sync. speed of 1/250 sec. was attained. The X sync. speed of the Nikon FM2 was also advanced to 1/250 sec. 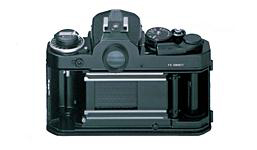 in 1984 (this model was called "NEW FM2" in Japan and "FM2NTM" in USA) and the FM2 together with the FE2 and the FA formed the Nikon SLR trio with "X 1/250 sec. and MAX 1/4000 sec." Further, the Nikon F-801 (1988) attained the MAX 1/8000 sec. and in 1992, the "MINOLTA a(alpha)-9xi" finally attained the MAX 1/12000 sec and X sync. 1/300 sec. Is this the limitation of the speed for the shutter unit driving the shutter blades or curtains mechanically or will there be any new development in not a distant future ? The Nikon FM2 will be kept in mind for ever as the camera which recommenced the technology development competition.